The Millennium Development Goals Report 2014 was launched in New York by the Secretary-General on 7 July 2014. 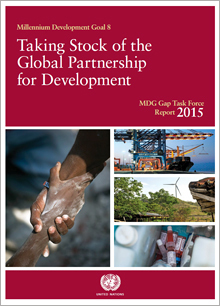 The 2013 MDG Gap Task Force Report was launched by the UN Secretary-General at noon (EDT) on 19 September at a press conference and webcast live. 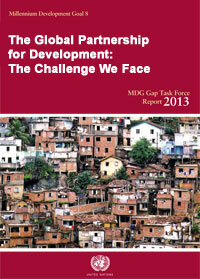 The Millennium Development Goals Report 2013 was launched in Geneva by the Secretary-General on 1 July 2013. The Rio+20 Conference, which took place in June last year, launched various processes as a result of the outcome document “The Future We Want”. Activities are now under way to make sure that commitments are put into actions. World Conference on International Telecommunications forges solid new framework for tomorrow’s hyper-connected world. At the UN Climate Change Conference in Doha, Qatar, governments have taken the next essential step in the global response to climate change. UN Climate Change Secretariat and World Economic Forum launch initiative to recognize climate-friendly financing, as part of the 'Momentum for Change' Initiative. The 2012 Access to Medicine Index was published on 28 November 2012, revealing GSK in the top spot. The index evaluates top pharmaceutical companies' access to medicine activities.